As a national debate over the future of the nation’s health-care system swirls, a new report from a liberal think tank indicates fewer working-age Americans, including Ohioans, are being covered under employer-sponsored health plans. A briefing paper from the Washington, D.C.-based Economic Policy Institute, titled The Erosion of Employer-Sponsored Health Insurance, shows employer coverage for workers and their families dropped for the seventh consecutive year. About 63 percent of Americans, or 164.5 million, under age 65 were covered in 2007, about 3 million workers fewer than in 2000, during which about 68 percent were covered. Employer-sponsored insurance coverage for working-age Ohioans fell at a similar rate over the decade. Last year, 6.8 million Ohioans, or nearly 69 percent, were covered by their employers, down more than 400,000 from 7.2 million, or 74 percent, six years earlier. As you probably already know, yesterday the Wisconsin Supreme Court heard the petition of the Wisconsin Judicial Council to amend Wisconsin Statue section 809.23(3), to permit citation of unpublished Wisconsin Court of Appeals opinions as persuasive authority. Taking a cautious step into a national trend, yesterday the Wisconsin Supreme Court voted 6:1 to permit citation of unpublished authored appellate decisions, with several limitations. Amended Wis. Stat. (Rule) s. 809.23(3), like Fed. R. App. P. 32.1, will be prospective only. This means that parties and courts will be able to cite those unpublished authored opinions which are released on or after the planned effective date of the amended rule, July 1, 2009. When parties cite such opinions, they will have to file and serve copies of the opinions. The rule specifically will provide that parties are not required to cite unpublished opinions. Finally, the supreme court has ordered that a committee be formed to plan the roll out of the rule and devise a means of tracking its effectiveness or particular difficulties it may create. Those statistics will be used by the court to review the rule three years after its adoption. As the Agarwalla brothers reported a few weeks ago, the Indian decision held that Scrabulous did not likely infringe on Scrabble’s copyrights, but that the name “Scrabulous” does likely infringe on Scrabble’s trademarks. The court therefore issued an “ad interim injunction,” which I assume is the same as a preliminary injunction, against further use of the Scrabulous name. But my primary interest is copyright law, and the court’s copyright analysis, although very brief, is fascinating. Essentially, the court held that because the board and rules are necessary for game play, and game play is not copyrightable, therefore the board and rules are not copyrightable either. I think this probably goes too far, but it’s an interesting example of a court grappling with the nature of copyright in games. I tend to be supportive of faith-based alternatives in state funded social programs and education for a variety of reasons. For better or worse, we live in a time and place in which most such services are going to be publicly funded. To exclude faith based approaches is to eliminate a set of approaches that might be quite effective and sends a message about the propriety of faith-based perspectives in the public square. My scholarship focuses on local government law, so you might assume that the next President would have little to do with my area of the law. Quite the contrary. In this era of shrinking government budgets and greater national debt, it is certainly conceivable that our next President will be faced with cutting spending on the federal level. It’s also plausible that Congress and the new President may make cuts in federal aid to state and local governments. I am somewhat agnostic on this issue. I have argued that decentralized decisionmaking leads to the more efficient and effective provision of goods and services, as well as policy outputs. I have also noted that much progressive policymaking occurs on the local level–more so than at the state and federal level. For these reasons, I might be inclined to encourage the new President to continue to fund local governments with block grants for various programs and services. But I also understand the need to get federal spending under control. What I am resolute on, however, is that any such cuts in funding should not be replaced with unfunded mandates for local governments from the federal government. Federal policymakers, including the President, seem to like to influence matters on the local level. It is one thing to do this through conditions attached to federal funding (I don’t love this approach, either, but I can accept it given that localities can choose to reject the money if they decide the conditions are unacceptable). But it is entirely another thing to attempt to dictate policy on the local level from the federal level without proper funding. Such unfunded mandates run afoul of federalism principles. Moreover, cities (and even states) face drastically different challenges where macro-level policymaking–the “one size fits all” approach–does not make much sense. Localities must have the resources and the autonomy to craft individualized solutions to their unique problems. Hopefully this will include continued aid from the federal (and state) government. But it certainly should not be impeded by unfunded mandates from the federal government. This should be the priority of the new President with regard to local government: Stay out of the way. What Do Reasonable Jurors Get to Decide After Scott v. Harris? By: Bruce E. BoydenPosted on October 14, 2008 October 14, 2008 Categories Legal Scholarship, Speakers at Marquette, U.S. Supreme CourtLeave a comment» on What Do Reasonable Jurors Get to Decide After Scott v. Harris? This is my second post commenting on Dan Kahan’s talk last week about his paper, co-authored with David Hoffman and Donald Braman, entitled “Whose Eyes are You Going to Believe? Scott v. Harris and the Perils of Cognitive Illiberalism.” (It was originally one post but got long.) Scott v. Harris is the case involving the video of the police chase, a video the Supreme Court found so compelling that it ruled the denial of summary judgement to the defendant police officer was error. Kahan and his co-authors argue that Scott harmed the legitimacy of the justice system when it concluded that all reasonable people would view the video tape the same way. In fact, Kahan et al. demonstrate that a significant number of potential jurors disagree with the majority’s view. On Friday, I tangled with the article’s proposed solution to the problem of denying those jurors their day in court. Today, I want to examine the decision itself–did the majority really rule that no reasonable juror could conclude that the force used in the case was excessive? That’s actually not the way it looks to me. Rather, it looks to me like, after a preliminary finding about dangerousness, the Scott majority pretty much threw the whole fact vs. law distinction out the window. Scott doesn’t just insult “unreasonable” jurors; even reasonable jurors get short shrift. In the last two weeks or so, my employment discrimination law class has been studying disparate impact litigation. One of the more challenging cases that we study is the Fitzpatrick case from the 11th Circuit concerning the no-beard policy of a fire department. The policy is supported by the need to have a good seal between a firefighter’s respirator and his face. The policy was claimed to have a disparate impact on black firefighters with a skin condition making in difficult for them to shave. The 11th Circuit, in 1993, found that although there might be a disparate impact, the fire department was able to show that the practice was consistent with business necessity because of safety concerns the fire department had regarding use of these respirators by firefighters even with so-called shadow beards. Fast-forward fifteen years and now comes a similar case in the D.C. Circuit concerning the no-beard policy of the fire department. Instead of race discrimination, this suit alleges that a clean-shaven face for safety personnel violates some employees’ religious freedoms under the Religious Freedom Restoration Act of 1993 (RFRA). As such, the Title VII framework does not apply and instead the court must balance the exercise of religious liberties with competing government interests. This type of balancing test reminds me much more of a public employee case involving free speech rights. In responding to the question, “What should be the highest priorities of the next President in the areas of law that you teach,” the answers in labor and employment law are many and clear. The next President should first focus on the following three areas in the labor and employment law context: labor rights, workplace anti-discrimination and civil rights, and employee benefit rights. When the Lawyer Messes Up, Should the Defendant Suffer the Consequences? By: Michael M. O'HearPosted on October 12, 2008 Categories Criminal Law & Process, U.S. Supreme Court2 Comments on When the Lawyer Messes Up, Should the Defendant Suffer the Consequences? This is the question posed by a criminal procedure case the Supreme Court recently agreed to hear. In Puckett v. United States (lower court decision at 505 F.3d 377), the prosecutor and defendant entered into a plea agreement: in return for Puckett’s guilty plea, the prosecutor agreed to support Puckett’s request for a sentence reduction based on acceptance of responsibility. When sentencing occurred, however, the prosecutor actually argued against acceptance, and the district court judge denied the requested reduction. On appeal, both sides agreed the prosecutor had breached the plea deal, but did not agree on whether Puckett was entitled to withdraw his guilty plea (the typical remedy for a breach). The problem was that Puckett’s lawyer neglected to argue at sentencing that there had been a breach. As a result of this forfeiture, the Fifth Circuit reviewed Puckett’s breach claim using the “plain error” standard, which required Puckett to show that the breach actually affected the sentence he received–a difficult burden in most cases because it is hard to know for sure the extent to which a sentencing judge is influenced by a prosecutor’s argument. Absent the lawyer’s neglect, Puckett would have been entitled to relief without showing prejudice under Santobello v. New York, 404 U.S. 257 (1971). In the Supreme Court, the parties will argue about whether Puckett and others like him should be penalized through plain error review when their lawyers fail to object at sentencing to the breach of a plea agreement. As a general matter, I do not care for the “gotcha” games that appellate courts play through forfeiture and plain error doctrines. I appreciate the judicial economy concerns that are used to justify the requirement that lawyers make all objections to trial court proceedings in a timely fashion, but the stakes are too high in criminal cases to hold clients strictly accountable for their lawyers’ mistakes–especially considering that most criminal defendants cannot afford to pick their own lawyers and are stuck with whomever is appointed to represent them. I might feel differently in cases in which there is some good reason to think the lawyer intentionally held back on an objection or argument for tactical reasons. But such cases are rare. I hope, then, that the Supreme Court make clear in Puckett that breach-of-plea-agreement claims are not subject to plain error review. In brief, Kahan and his co-authors argue that the Supreme Court went awry in Scott by refusing to credit the views of “an identifiable subcommunity” as being within the realm of those held by “reasonable jurors.” This refusal to credit such beliefs with reasonableness, they argue, is potentially destructive of the legitimacy of the justice system. By: David R. PapkePosted on October 10, 2008 October 10, 2008 Categories Legal History2 Comments on Happy Columbus Day? 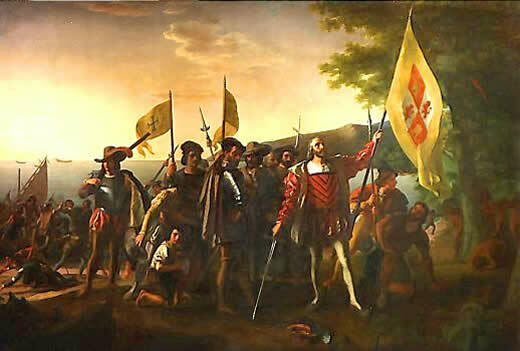 We have put aside naive notions of Christopher Columbus as the heroic discoverer of the New World, but on Columbus Day and in general we should continue to contemplate the troubling bases and ramifications of Columbus’ voyages. Columbus’ voyage in 1492 rested on his contractual agreement with the King and Queen of Spain. In return for spices and especially the gold he anticipated finding, Columbus received financing for three small ships and a combined crew of 40 and also promises of ten percent of all profits, the lucrative governorship of any new-found lands, and the title “Admiral of the Ocean Sea.” Columbus returned from his first voyages with a few spices, gold he had plucked from native peoples’ ear lobes, and 350 newly enslaved men and women. (An additional 250 had died on the sail back to Spain.) The King and Queen were impressed enough to finance a second expedition in 1493 of seventeen ships with 1200 men–including a full cavalry troop and a half-dozen priests. The fleet raided and plundered the Caribbean islands and was followed by subsequent large expeditions under Columbus’ command in 1498 and 1502. In the past few years, many states have passed legislation allowing parents of newborns to drop their infants off at a designated safe place, no questions asked. These laws are intended to prevent the tragedy of unwanted newborns that have been literally left to die in dumpsters, public toilets, and similar places, usually by panicked teenage parents. Nebraska is the most recent state to pass such a law, but whether by negligence or design, the Nebraska statute did not specify a maximum age of a child who could be left at a safe place without legal repercussions to the parents. In a turn of events that would be comical if it weren’t so sad, Nebraska has seen a parade of 17 different children dropped off at designated hospitals: none of them have been infants, and most have been adolescents. Since Nebraska’s legislature is part-time and does not resume session until January, there may be more drop-offs before the law can be amended.